This recipe can be made with almost any ingredients you enjoy eating, but I recommend sticking with a healthy version with lots of vegetables. Use a large pot and freeze portions for later use. Begin by roasting the chicken in the oven for one hour at 425 degrees. Use a chicken stand that allows most of the fat dripping from the skin to drain into the bottom. Discard these drippings to reduce the fat in the soup. After roasting the chicken, place it in a soup pot and cover it with water. Add diced onion, cilantro, diced green chilies and season with salt, pepper and garlic to taste. Cook the chicken until the meat falls off the bones. 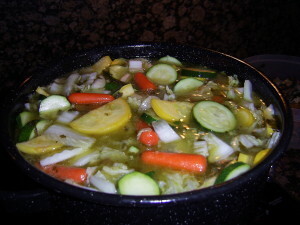 Remove chicken from water, discard the bones and skin, chop the meat and return it to the broth in the soup pot. Drain the beans and add them to the pot. Chop and add the vegetables. Simmer for about one hour. Enjoy! As an option, brown rice is a nice alternative for the beans.